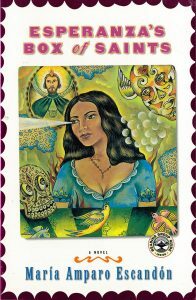 Bestselling bilingual fiction writer originally from Mexico whose first novel, Esperanza’s Box of Saints (Santitos in Spanish), has been translated into 21 languages and made into a Sundance Festival Award-winning film produced by John Sayles. Ms. Escandon’s latest novel is Gonzalez & Daughter Trucking Co. (Three Rivers Press, 2005). I always tell my students that we all have a story to tell. Just by living and observing how circumstances affect us and others we have enough material to write not one, but many, stories. But in order to take full advantage of this experience as writers, we must use it in conjunction with the art of expression. We must translate this experience into words that will convey unique meanings to others. Each of us has different needs in terms of how to approach this thing called writing. In my particular case, I compare writing to exercising. If the brain were a muscle, writing would be the workout. We all know that to workout successfully, we must have discipline, obey a certain routine and keep on doing it. It is the same thing with writing. When we go to the gym, we receive training and support from an instructor, then we watch other people’s techniques and skills at lifting weights or running, and when we reach them, we go a step beyond, until we become really fit. Again, the same with writing. It is not just a matter of inspiration, as you see, there is also a lot of perspiration. The student is the player, and the teacher is the trainer/cheerleader. And taking the Writers’ Program’s courses on an on-going basis helps you beat procrastination, one of literature’s worst enemies. Instructor Website: Click here to leave our website and go to Maria’s website.